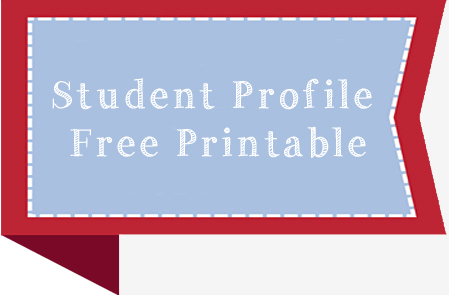 This week we have another free printable: a Student Profile. We have been using these since our son first started preschool, and we think they are a fantastic idea. The student profile is a quick way to introduce your child to new teachers, staff, therapists, and even bus drivers at the start of the new school year. Not only that, but it gives a well rounded picture of your child, far beyond the impressions that teachers may get from reading an IEP (because let's face it, IEPs tend to highlight challenges more than strengths). By the way, a Student Profile is a wonderful tool for all children, not just those with special needs. Our son's teachers always loved getting the profile - they said it was like a road map, and they wish that all kids came to school with one. We also pass out copies of the Student Profile at IEP meetings. With a picture of our son's smiling face peeking out from the paper, it is a perfect reminder of why we are all gathered there. Not only that, but it saves you a lot of trouble trying to think up answers to some of the questions on the form. It's a win-win, no matter how you look at it. Please download the Student Profile and feel free to share. And stay tuned for the next installment in CHART's Back to School series!